The Americans have won their first gold medal in women’s hockey since 1998. The 3-2 shootout loss the Canadian women’s hockey team suffered to their bitter rivals from the United States left each of Canada’s 23 players stunned, devastated, or in tears. It was an outcome they weren’t used to, with Canada having won the last four gold-medal finals at the Olympics, three of those over the Americans. It was the speed of the Americans that was the ultimate difference in the game. The U.S. played with decidedly more pace and urgency during the third period and the 20-minute overtime and thanks to Jocelyne Lamoureux-Davidson who scored the shootout winner, the Americans earned their first gold since a 3-1 win over the Canadians at the inaugural Olympic women’s hockey tournament in Nagano in 1998. It was the first Olympic women’s hockey final to go to a shootout. 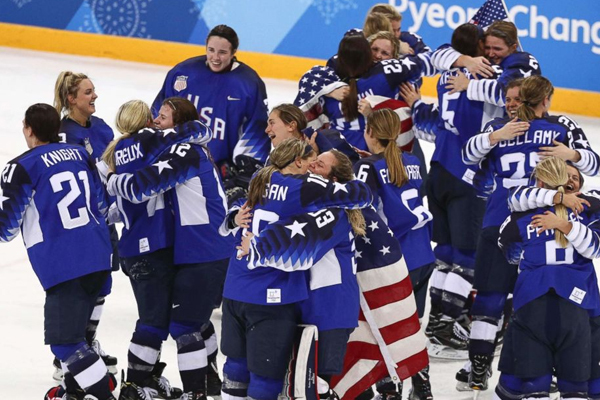 The U.S. players celebrated on the ice, draped in the American flag, as they gained a measure of redemption for their heartbreaking overtime loss four years ago. This american team will go down in history not only for this win, but for their willingness to fight for equal rights. Last March, they threatened to sit out the world championships if USA Hockey did not give in to demands for equitable treatment to the men’s team and provide improved salary and benefits to women. USA Hockey looked for replacement players, but women’s hockey players in the United States stood together and won increased wages and perks.